There’s nothing quite like a light bike. When you’re on the road it responds to your every thought and whim, leaving your opponents in the dust. The Challenge Fujin SL II – what’s the extra going to cost you? All other things being equal, a lighter bike is faster of course. But by how much exactly? How much should you be willing to pay to save a few grams? 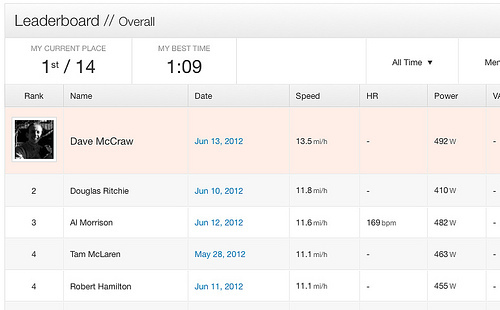 I recently got involved in a bit of competitive hill climbing (courtesy Strava). Even though my commuter bike weighs about 30lbs, I’ve been very pleased with my results. The problem is just that I’m putting out far fewer watts than the people at the top of the table! 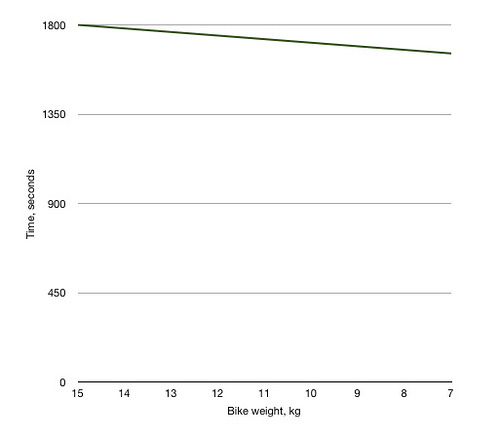 I wanted to try and quantify how much my heavy bike was holding me back, and since the sums are actually pretty easy, the rest of this post is just generalising and discussing the implications. Strava. It’s sick and wrong. This segment is out of the way, hence I’m vaguely competitive! The speed at which you climb is dominated by the power you put out versus the work needed to overcome gravity – rolling resistance and other frictional losses are minimal and unlike riding everywhere else, aerodynamics isn’t getting a look in. 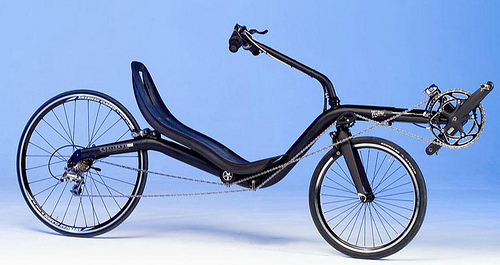 Let’s take a typical, relatively sprightly bike of 25lbs / 12kg as a demonstrator. You can ride this uphill at 10mph. What would be the benefit of losing 1lb / 0.5kg on your climbing performance? Let’s be generous and imagine that you’re climbing a hill that’s relentless and 10 miles from start to finish. What time saving on the climb does this speed difference represent? So if you were climbing for a whole hour steadily, cutting 1lb from your 25lb bike would save you 18 seconds. Now, it goes without saying that 18 seconds is a huge advantage in a pro race, where the finish comes down to the wire and even a fraction of a second separates victory from disgrace. But are you riding in a race which climbs for a solid hour, if you’re even racing at all? If you were attacking a small hill that takes three minutes to climb, you’d lose about a second from bottom to top as a result of that extra pound of weight. And that’s at 10mph – if you can tackle the hill at a more respectable 15mph, you’d lose just half a second. Half a second isn’t much at all – less than two bike lengths, or one or two wheels further back, if you’re in a group. This first chart shows the time saving in seconds of each kilo lost from a bike (or rider). The baseline is one hour at 10mph on a 15kg bike, quite an effort. Now it’s not looking like such a big deal, huh? There are plenty of people, in reality, who should be quite happy to save hundreds of pounds (£) and be a little further to the left of a chart like that! 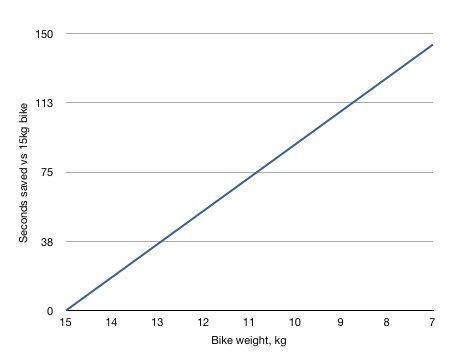 Instead of comparing the weight difference between two bikes, of course, we could use the formula to calculate the benefit of a lighter body-weight. Professional cyclists put out power in proportion to their weight (that is, a lighter rider makes fewer watts than a heavy one) but I’m not convinced you can generalise that to mortal riders, who aren’t likely to compromise their power by losing a few kilos from their middle-age spread! Suppose 90kg and 75kg riders can put out the same power and are riding identical bikes – how much faster will the light rider be? Over the course of that hour climb, how much time will the lighter rider save? Wow. Being out of shape or heavily built will cost you many minutes while cutting a pound off your bike (even your wheels) is just spitting in the wind. 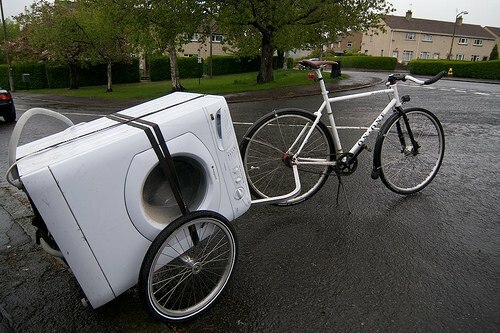 Naturally, the fact that the weight comes from the rider rather than the bike makes no difference to the maths (even if it comes from the rims), but there are practical implications – you can’t very well trim 15kg from a sub-15kg bike however hard you try! It will also cost a fortune to trim grams from your bike, whereas getting in shape by biking to work will save you a fortune. Let none of this be taken as a reason why you shouldn’t ride the greatest and lightest bike you can do, of course, but hopefully this will help you put some perspective on the real meaning of weight in your current / prospective bike. Okay, *sometimes* you need to wonder if weight is holding you back! There’s no question that if all else (especially stiffness) is held constant, a lighter bike will be faster; it’s just that the real impact is probably much less than people expect. When somebody jumps on a lighter bike and claims to have taken minutes off their local climb they’re either benefiting from placebo or they live at the foot of Mont Ventoux! Unless you’re going to be riding very seriously, where seconds count, the difference between bikes otherwise of the same category (for instance, the 15kg Nazca Gaucho and the 11.5kg Bacchetta Corsa) might simply not be significant compared with the big questions like how easily it handles, comfort, or luggage carrying capacity. You’re absolutely right Dave, but aerodynamics tend to be better with lightweight bikes too, and that’s where the speed gains are. That said I’d still rather ride my Pashley. In 1956 Roger Walkowiak won the TdF at a then record average speed of 36.2 kph in a race of 4527k with 14 stages over 200k. Mercx’s speed was 35kph four 4 of his 5 wins.Hinault increased the average to 36/37kph for his 5 victories. Since 1996 the average speed of the Tour has hovered around 39 to 40kph. An increase of 3 – 4 kph in fifty years of the development of man and machine and the overall appliance of science to cycling not to mention performance enhancement. Maybe a large element of performance is in the head and not in the technology? Interesting comparison of the effect of body weight versus bike weight. Reducing the rotating mass of the wheels by 1lb would have a greater effect than the loss of the same mass from elsewhere on the bike because heavier things spin slower than light things. Since the bike is propelled uphill in a series of tiny accelerations the lighter the wheel rims/tyres/tubes the less force is required. The maths for that though is well beyond me. Very good article! As a heavy rider with a heavy bike I have prioritised the body element of the equation. (Not getting much lighter though, but at least I’m getting stronger.) I’ve long been aware of the relative unimportance of bike weight (lose 10% off the bike, and bike + rider is only ~1% lighter) but it’s nice to see the numbers for climbing. Re Tom Orr’s comment; I can see the impact on acceleration although uphill neither wheel is spinning fast. Flywheels, in some applications, are both heavy and spin very fast indeed with (apparently) very little input. Like Tom, the maths are beyond me though. Just the right explanation for a maths duffer. Has set my mind at rest.